Illuminati News: Would You Give Your Child Cocaine? hile unfunded individuals and grass-roots groups are screaming at the top of their lungs about psychiatrists drugging our children based on made-up diseases, drug companies run hourly television ads to spread the false message of chemical imbalances. That no blood is ever drawn to prove this imbalance and that no normal child has Ritalin or Prozac coursing through their veins hasn't stopped this catch-phrase from becoming our version of the flat-earth concept widely accepted 400 years ago. While teachers and psychiatrists are paired up to push drugs to "help" schoolchildren study, we also have TeenScreen partnering with psychiatrists coming in on the child suicide angle. Behind both groups are money-hungry billion dollar drug companies. It doesn't matter that TeenScreen identifies eighty-four non-suicidal teens for evaluation for every sixteen it correctly identifies (that's just more money for the psychiatric profession when they prescribe the drugs). 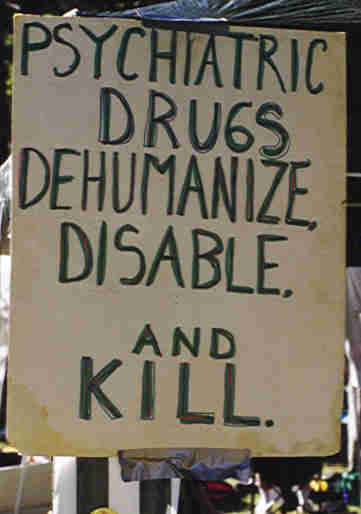 For today however, let's not even argue against this fabricated disease (Attention Deficit Disorder) or this sensationalistic worry about suicide (children are six times more likely to die in automobile accidents), but instead let's take a stroll through the KNOWN side-effects of one drug which psychiatrists happily prescribe to millions. Will Ritalin improve your child's grades? If Ritalin could do this, don't you think that Novartis would announce this to the world? The vast majority of children on Ritalin have either NO improvement or their actual achievement scores deteriorate. In The Learning Mystique, Gerald Coles confirms a 1978 review of seventeen studies and they all agree: "stimulant drugs have little, if any, impact on…long-term academic improvement." A large percentage of these children become robotic, lethargic or depressed. What about fitting in to society? Studies prove that children on psychiatric stimulants for ADHD are 46% more likely to commit one felony, and 36% more likely to commit two or more felonies. Does it make you kill? 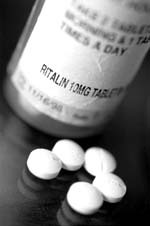 According to the American Psychiatric Association, SUICIDE is the major adverse reaction of Ritalin withdrawal. Suicides and attempted suicides only occur in three cases though: when stopping usage completely, when reducing the dosage or when continuing with the same dosage! Besides suicides, the list of school shootings and family homicides by Ritalin and Prozac kids is staggering. We all know of people who do things while drunk that they don't do when sober, so why are we surprised when we give a child a daily dose of a Class II stimulant and he does something terrible? How about impact on the body? Heart problems, blood disorders, brain damage, facial tics and death are just some of the side-effects too numerous to mention. From 1990-2000, 186 died from the use of these drugs, but because the FDA has a voluntary reporting scheme, it is estimated that this represents only 10-20% of the actual cases. However, one side-effect stands out even more: "Ritalin can mutate the child by not allowing the child to grow to full size." Sociologists have traced everything from sexual selection of mates to job-hiring based on height; so how permanently disfiguring is this? The literature suggests giving your child holidays from Ritalin to counter this, but children's bodies and glands operate twenty-four hours a day, not just during holidays! How about addiction? Novartis will claim that Ritalin isn't addictive. However, in a study of 5,000 children with ADHD who were followed from adolescence to adulthood, psycho-pharmacologist Susan Schenk of Texas A&M University concluded that children treated with Ritalin are three times more likely to develop a taste for cocaine. In British Columbia in the late 1980's, when heroin addicts shifted to Ritalin, the burglary rate increased 105% because while a heroin addict will inject two to three times a day, a Ritalin addict shoots up every two hours. Are there any long-term mental effects? Medical researchers in the Psychology and Pharmacology fields, Travis Thompson, Ph.D., University of Minnesota and Klaus R. Unna, M.D., University of Illinois say: "Perhaps the best-known effect of chronic stimulant administration is psychosis. Psychosis has been associated with chronic use of several stimulants; e.g., amphetamines, Methylphenidate (RITALIN), phenmetrazine and cocaine." (So the child patient of psychiatry is now manufactured into the adult patient of psychiatry!) There is also evidence that Ritalin can cause shrinkage or other permanent physical abnormalities in the brain. have kids, go bowling, collect the next Beanie Babies, attend church, and enjoy life but are now doomed to become drug addicts, felons, and just plain psychotic? We all want smart children, but this isn't Lake Woebegone. In any school half of our children will be below average! We can still brag on our child's size, their musical ability, their athletic prowess, or their ability to fix cars or computers. But not a single parent ever brags about their child being a drug-addict! Think about that before you allow your child anywhere near a psychiatrist. After this short stroll down the long littered highway of Ritalin side-effects, just in case none of the above is enough to keep you from forcing a daily fix of a drug in the same class as cocaine down your child's throat, maybe this point of ironic justice will: In one group of Ritalin kids studied, thirty-four percent threatened to kill their parents. Is there any greater threat to children, parents and society at large today than psychiatry, their false labeling and fraudulent treatments?